Fat Bruce Lee was busy on this particular day, so to make up for his prodigious appetite, I gathered three volunteers to accompany me to Salt’s Cure in West Hollywood. 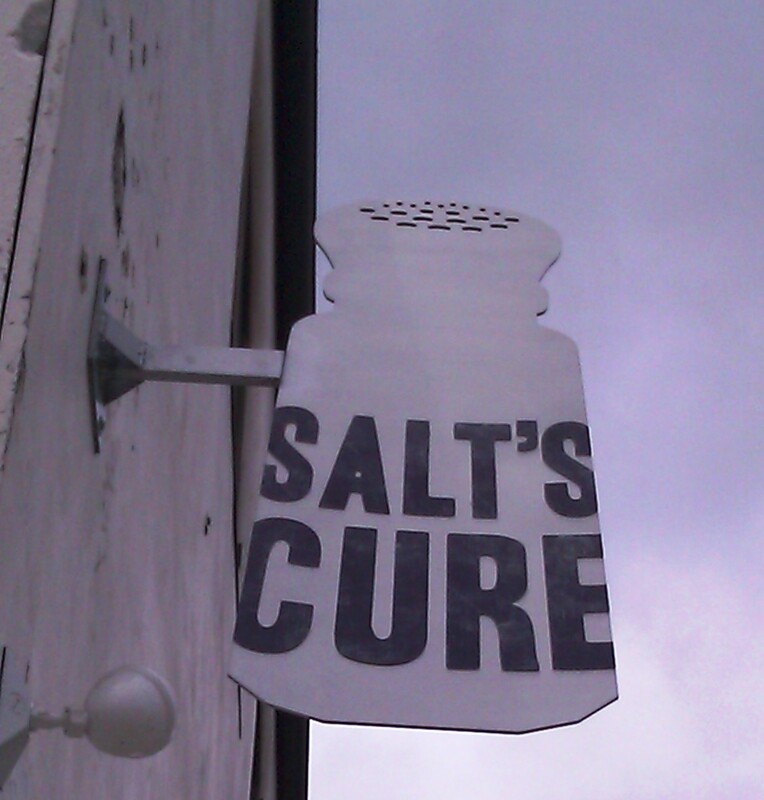 Salt’s Cure was on the corner of a burger-heavy intersection. Astroburger was located diagonally, and Fatburger was across the street. There was free parking just past Astroburger, which was nice. The 30-seat restaurant was spotless, and the open kitchen was gleaming. This was excerpted from their site: Salt's Cure is a West Hollywood restaurant. Every meal at Salt's Cure proudly sources ingredients grown and raised in California, all of which are carefully butchered and crafted in house. 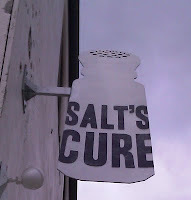 Salt’s Cure was all about taking local and localish ingredients and turning them into a small but very adequate menu. On the day that we visited, the daily menu posted on the chalkboard consisted of just 7 entrées. One of those entrées was a $15 Bacon Cheeseburger. We ordered 4 of them and settled in for a 15-minute wait. 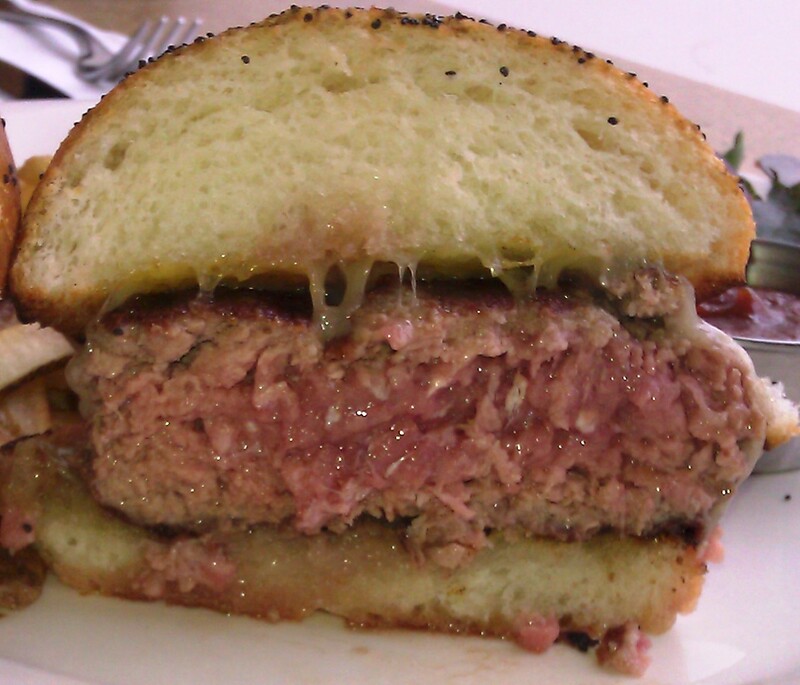 The Beef: The beef was sourced from a farm/producer near Santa Barbara, CA. 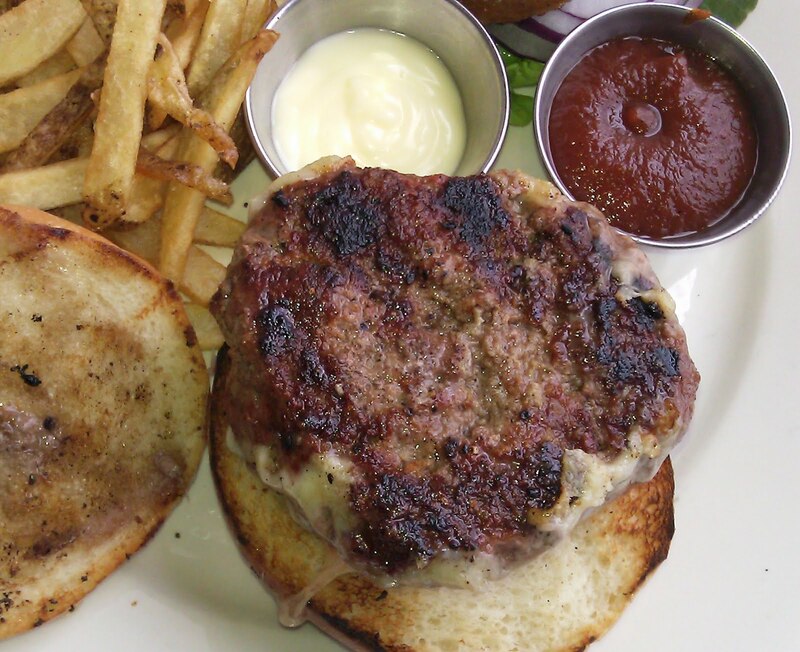 The cattle were grass-fed, and the Chuck from which the burgers were created was dry-aged. The funky gaminess of the dry aging really came through in the Salt’s Cure burgers—this was particularly satisfying. The Chuck was freshly coarsely ground in-house, and it boasted a fat content of 30%. As I watched Chef Chris Phelps form our burgers to order, I was struck by the light pink color of the rich, ground beef. We ordered our burgers Medium so that the collagen in the Chuck would be sufficiently melted to develop a beefy flavor, and we were rewarded with a very strong note of satisfying beef. This,coupled with some iron and the strong funk delivered a well-rounded bite, which was absolutely delicious. The high fat content did cause the burger to be oilier than I was comfortable with. My companions all finished their burgers, and they all fell into immediate food comas as their digestive systems went to work on processing 2.5 ounces of beef fat from the 8 ounce burger patties. I found it difficult to set half of my burger aside, since it was so flavorful. The Seasoning: The burger patties were PERFECTLY salted on the exterior. This served to amplify the already booming beef flavors. It also served to dry out the sear and caused it to develop a satisfying crispness. The Sear: The burgers at Salt's Cure were cooked on a wickedly hot gas grill. The seared layer on the burgers was reminiscent of bacon due to its crisp, oily, and salty nature. The sear was ideal. As our burgers cooked, the small space became a little smoky--this actually served to make us feel more in tune with the cooking process. The Preparation: I looked on with some concern as Chef Phelps manipulated the fresh burger patties for what seemed like an undue amount of time. However, the resultant burgers were perfectly tender and toothsome in texture. It occurred to me later that burgers with a high fat content would need that extra manipulation to form tighter protein bonds, which would in turn impart a texture firm enough to stand up to the fats in the beef. Our requests for Medium all came out Med-Rare, but this was fine, since the beef was inherently flavorful. The grill was so hot that getting the interiors of the thick burgers to Medium would have been a challenge without over-searing the exteriors. It was a fine trade-off. The Cheese: The cheese du jour was Wagon Wheel from Cowgirl Creamery. This was an American Swiss cheese. It was nicely melted. The cheese had a mild tang, and it was pleasantly nutty. The mild cheese was an ideal topping for the savory burgers. This was very similar to the Cheddar cheese used by Fish & Farm in San Francisco. The Bun: The house-baked brioche-style bun was fresh, yeasty, moist, springy, creamy, and densely topped with crunchy poppy seeds. The buns were buttered and toasted on the grill, and they provided some crunch around the edges. The poppy seeds were a genius touch. Since the burgers were very juicy, the seeds ensured that every bite was rewarded with a crunchy texture in spite of the moisture that flooded from the beef. The Meat To Bun Ratio: It was perfect. The Fries: The fries were cut in-house. These were flat, skinny cut, peel-on fries. They were cooked to a perfect and crisp finish in plain old vegetable oil. The fries were well-seasoned with coarse salt. The fries were a winner, and they did not last long on the plates of my fellow diners. The Toppings: The Romaine lettuce and red onion were both crisp and fresh. The house-made ketchup was strongly seasoned with coriander, and it was approaching the territory of barbeque sauce...I like barbeque sauce, and I was a fan of the ketchup. The bacon--ridiculous! The bacon was thick, smoky, and had a texture like brisket. The bacon was excellent. The Value: This was a $15 cheeseburger with fries. This was a delicious, locally/regionally-sourced cheeseburger made with intensely fresh ingredients of exquisite quality. Considering the high quality of the burgers, at this price point the value was average. 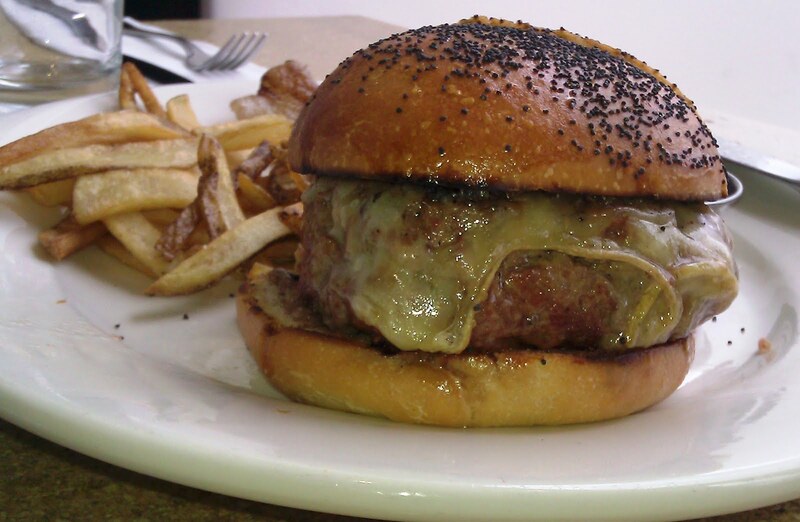 The cheeseburger at Salt's Cure was a savory revelation. The beef was intense, and the bun and cheese complemented it perfectly. The fat content was higher that I was comfortable with, and it certainly knocked the wind out of my dining companions. That said, I would gladly return to Salt's Cure for more burger goodness. I would split a burger and another entrée, however. Burger Review : Fresh, local, and delicious. This was the sort of burger that will renew your faith in Chuck. A good and consistent review. Two things: First, the burger in the last photo does not look like it was cooked to medium, but more like medium rare or rare. Second, you love the word "toothsome" but no one knows what the hell it means. I ate here today. I thought it was average. But I made the mistake of eating the bacon separately, making the patty taste rather prosaic by comparison. Also, I don't like big bulbous buns. My bun was kinda dry, but then I think most big buns are dry. The large, raw white onion was like a shot of ammonia. I see that in my other comment I said your burger looked medium rare, not medium the way you wanted it. But you'd already mentioned that point in your review. Which makes me a doofis. I am going to give Salt's Cure another shot simply because I respect your judgement and your photos make me want to eat my computer screen. Sunday is a tough day for burgers. The buns are rarely delivered on Sunday, so you're begging for staleness. Also, I have found that the kitchen's B-Team is generally on the field on Sundays, since the top staff generally covers Saturday evening. White onion----yech---I hate those, too.